Be Courageous. Laugh. Embrace Your Uniqueness. Spread Joy. This is the story about Jaida; a friendly little caterpillar with a powerful message. A surprise visit to Mocha and Petri’s dollhouse leads the three to an everlasting friendship. Each day is filled with a new memory, until the day that Jaida stops coming to visit. As Mocha and Petri begin to accept the loss of their friend, they soon learn that Jaida’s greatest lesson has yet to come. Gerbs in the House: Jaida’s Here is a friendly children’s story about love, life, loss and transformation. Gerbs in the house: Jaida’s Here is a simple and beautiful story about friendship and change, and how what matters is who we are inside — not by the way we look. It also talks in a metaphorical way about loss of a loved one, and how suddenly a friend you love and thought lost comes back to you in a completely unexpected way. Talking to children about loss is hard, specially when this loss comes in the form of an untimely death. By transforming a little caterpillar into a beautiful butterfly, the authors help children’s imagination to be able to understand and deal with loosing someone. As an adult, I couldn’t quite go past the fact that the entire story is inspired on the passing of a beautiful 7 year-old suffering a debilitating disease. If you need to tackle something this sad and hard, this picture book is a very good tool to open up the conversation with your kids. Jaida Maeve Cumberland was a fiery little red haired girl from Loretto, Ontario, with a sparkling personality and the courage of a lion. 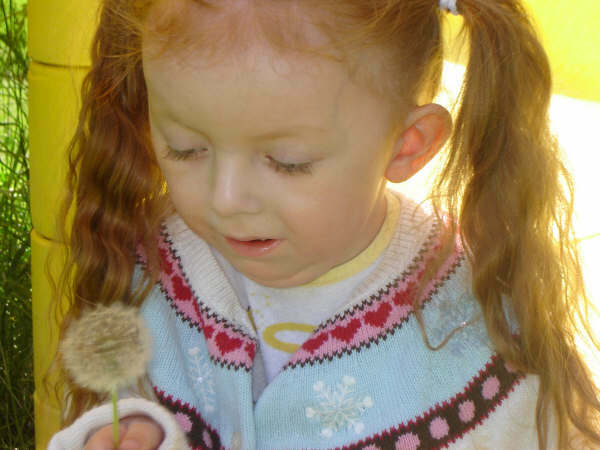 She was diagnosed with a neuro-muscular disorder at the age of 18 months. Her waning strenght over the 7 and a half years that she spent among us did nothing to dim the light that she cast on the lives of all who knew her. It’s been said that the measure of a life can be gauged by the number of lives a person touches on their journey. By that account, Jaida lived a life far, far beyond her years. A portion of the proceeds from the sale of this book will be donated to Jaida’s Challenge. The inspiration for the book broke my heart! I think there’s a huge need for these books, and to be easier to find. It was incredibly hard to find a book about loss for my kids that wasn’t religious. Oh, Jacqui! It just dawned on me that we both wrote sad posts today!